Pinball Wizard from Terminal Software was released on the VIC-20 in 1983, but I’m not entirely sure when I picked it up; I’m going to say that my mum finally relented and let me spend the exhorbitant amount of £8 in the fledgling game section in Woolworths, Bedford, sometime in early 1984. The general lack of games that would be available until a few dedicated independent shops started to appear in Bedford a few years later (just as VIC began to wane) may have been a big part of what caused 11-year old me to start bugging my mum to let me buy it. 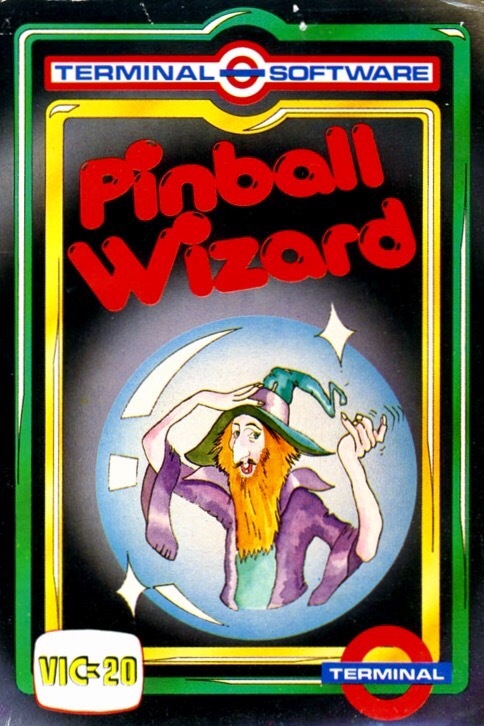 The cover was definitely an influence – a cartoon wizard that looked like a cross between Ian McKellan’s Gandalf from years later and a village idiot, trapped inside a [pin]ball. Not so sure about its claim to be a “wonder of simulation that makes unsurpassed use of the VIC’s graphics specifically written for the unexpanded VIC 20.” Not even sure what that means, but it was obviously more than enough to justify not having a screenshot on the back of the case! Instead, it told you even more – hi-res, full colour, flicker free, 100% machine code. 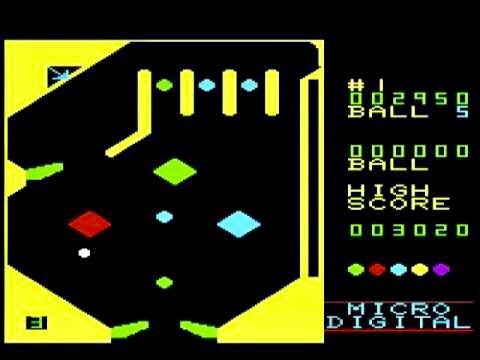 None of that really mattered though, just like the reality of a black screen populated by three big diamond shapes that the ball bounced off, and a some smaller ones in three channels that changed its colour as it passed behind them. But as also promised, the “gravity simulation” seemed fine, it had three flippers, and I was playing real pinball on my computer, and to me that was what mattered. And it had cost £8, so I was compelled to play it and play it and play it regardless! When I eventually sold my VIC-20 to help fund the Spectrum+2 that followed, this was one of two games I simply couldn’t part with. The other was Submarine Commander, which I’ll get to here at some point too. See you next time, when we’ll choose another title from my gaming history.